Who Was Dr. Wilhelm Reich? And Why Has History Tried So Hard To Erase Him? The following superb article, from the March 13, 2003 issue of The Idaho Observer, is offered as an important extension in conjunction with this month's front-page feature story. Dr. Wilhelm Reich is mentioned in that story (along with Dr. Royal Rife) as another significant trailblazer whose advanced research was viciously attacked and suppressed by those wishing to preserve the status quo of people control on planet Earth. Reich's research opened up vistas of possibilities with such far-ranging implications—well beyond "just" the simple curing of illnesses—that his work held the keys to nullifying the core forces of coercion utilized by the world controlling elite to keep the rest of us in line. You can imagine how many big-ego toes he stepped on— whether he realized it or not! "If orgone energy does not exist, it is, therefore, not a threat—is it? 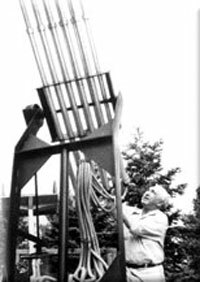 "Rather than ignore this thing that does not exist, the FDA effectively sentenced Dr. Wilhelm Reich to death and, for at least a decade, actively pursued a campaign to destroy all the books, notes, and research papers it could find containing the word 'orgone'. Judging by the government's actions, orgone energy does, indeed, exist"
Their extreme actions against him only served to reveal beyond any doubt just how important Reich's research actually was. Dr. Wilhelm Reich (1897-1957) is still noted historically for his work in psychiatry and psychoanalysis. However, Dr. Reich's work in biophysics has been stricken from the historical record. His work encompassed 40 years within six countries, but in the end he suffered the indignity of seeing his life's work banned in America and tons of his books and journals burned by the U.S. Food and Drug Administration per bureaucratic decree. It was a brazen act of censorship that is overlooked today within the texts of history. Prior to his orgonomic research, Dr. Reich had earned an international reputation as a scientist of integrity. Once, after he had demonstrated orgone energy to Albert Einstein, the famous physicist exclaimed that "this would be a bombshell to physics". Dr. Reich spent his last days in prison falsely labeled a quack and a racketeer by the American government and the American medical system. Wilhelm Reich was born in Austria in 1897 as the son of a rather wealthy farmer and, as was common at that time, he was home schooled, first by his mother and later by a number of tutors. He excelled in his studies because of his intelligence and also, in part, out of fear of his father's horrible temper that would erupt over something as trivial as an incorrect answer in his studies. Reich's family was tragically dysfunctional and, at age 13, his mother poisoned herself to flee the abuse of Reich's violently-tempered father. Four years later, Reich's father died of pneumonia—a financially destitute and lonely man. Reich, at 17, ran the farm himself for a short time after his father's death, but the property was destroyed by World War I in 1915. After serving in the Austrian army on the Italian front, Reich began attending classes at the University of Vienna and graduated in 1922 as a doctor of medicine. While studying for his doctorate, Reich became a protégé of Dr. Sigmund Freud, and soon after graduating became the clinical assistant at Freud's Psychoanalytical Clinic where he, himself, became a pioneer in psychoanalysis. In his book Character Analysis (1933), Dr. Reich detailed a biological basis for neurosis and provided a step toward the discovery of the cosmic orgone energy. During the years 1936-1939, Dr. Reich conducted experiments concerning the idea of airborne infection. He showed that microorganisms form themselves from inorganic material and disintegrating organic substances. He proved where airborne germs came from and demonstrated the absurdity of the commonly held "air germ" theory. It was during these experiments in 1939 that Dr. Reich accidentally discovered radiation particles which he later named orgone. An assistant had mistakenly taken the wrong container from the sterilizer and heated the substance within it to incandescence. The substance was common ocean sand and, when cultured and inoculated on an egg and agar medium, yielded a yellow growth. When viewed under high magnification this growth was seen as vesicles (he called them SAPA bions) that glimmered an intense blue color that, in time, would grow and then move about. As he continued to experiment with these "bions" he noticed that, when he placed live cancer cells next to them, the cells would die. It was during days of observing these phenomena that Dr. Reich came down with an extreme case of conjunctivitis, and his eyes became very sensitive to light. He noticed that it affected his eyes the most when he was looking at these vesicles through his microscope. During the course of this work, in the winter of 1939, Dr. Reich also noticed that he had developed a suntan under his clothing. He reasoned he was being exposed to some type of radiation, and it greatly worried him. He used a radium electroscope to test the culture tubes, and it gave no reaction. It took a few weeks for him to realize that this newly noticed radiation (that he had named "orgone") was present everywhere. Taking his SAPA bions into the darkness of his basement and waiting for two hours, he noticed that his hair and clothing emitted a blue glimmer, and the room was filled with a hazy, slow-moving, gray-blue vapor. Over time, Dr. Reich demonstrated that the orgone radiation was the same energy that the Sun gave off and that the incandescing and swelling of the sand had released this energy once again from its material state. He was forced to this conclusion by the facts before him, but he admitted having to overcome great emotional reluctance in doing so. Further experiments showed that this ever-present orgone would be repelled by metal objects and absorbed by organic material. By making a box with alternate layers of organic material (wool) and metal, Reich found that he could accumulate a more concentrated field of orgone. He called these boxes "orgone accumulators" and they played a major role in his experimentation with orgone. Nearly 15 years later, the American government made an attempt to wipe the very word "orgone" from the English vocabulary, by banning the accumulator and destroying Dr. Reich's books and journals. He was also able to demonstrate and measure orgone with a thermometer and an electroscope, as well as with a Geiger counter. [Editors note: These very sensitive but very different devices—and other instruments, if they had been available at the time—all respond to this energy because it interacts with the very SUB-STRUCTURE of the physical matter out of which all the different instruments are necessarily constructed. For example, it's not that the orgone is radioactive; but in the case of the Geiger counter's REACTION to an orgone concentration, it may seem that way. In actuality, the concentration of orgone likely changes the properties of the gas in the Geiger counter's high-voltage tube, causing the gas to behave differently (like ice behaves differently than water or steam), and thus the Geiger counter acts AS IF something radioactive were present. What astounded Dr. Reich was the fact that, for over two thousand years, the presence of this orgone energy was overlooked or argued away whenever a scholar attempted to describe what he saw. What Dr. Reich discovered is nothing short of the energy responsible for the biological pulsation of life on Earth (and possibly the universe). Rather than embracing Dr. Reich's discoveries, the collective (politically motivated) scientific community responded with levels of anger and derision that bordered on hatred; rather than conducting investigations of their own and furthering the knowledge of orgone energy for the betterment of mankind, the (politically motivated) scientific community led the charge to destroy any documents that even mention the word "orgone". And then the (politically motivated) scientific community destroyed Dr. Reich. Though a meticulous researcher and prolific scientist, Dr. Reich saw himself as only a pioneer in the field of orgonomy (the science of orgone) and likened himself to Christopher Columbus. In his book Ether, God, And The Devil (1950 and 1951), he said that, as Columbus did not discover New York City or the resources on the West Coast of America, but rather a stretch of seashore that was up to that time unknown to Europeans, so he only discovered the orgone energy. This phenomenon, being the common etheric energetic thread coursing through all life forms, represents a universe of discovery of which Dr. Reich located only one small shoreline. The object of the (politically motivated) scientific community's opposition of Dr. Reich's work was his "orgone accumulator". The orgone accumulator, a "box" large enough for a person to sit in and constructed of alternating layers of organic and inorganic substances, was used to successfully treat his patients for various maladies. In his book Cancer Biopathy (1948), Dr. Reich recreates his carefully documented work regarding the treatment of several cancer patients deemed hopeless and terminal by orthodox medicine. Several of his cancer patients were "cured" but, being the careful man of science he was, Dr. Reich was careful not to declare orgone treatment as a cure for cancer. After a lengthy harassment campaign by the FDA over the medical use of orgone, that began in the mid 1940s, Dr. Reich died in prison in 1957. All of his books and papers were, by federal decree, burned, up through 1962, and may have continued on a lesser scale until 1970. The government of the United States had declared that orgone did not exist and orgone was the only word that was necessary to appear in print to qualify the material as worthy of destruction. During the course of his varied orgone experiments, Dr. Reich touched upon many aspects of science. Among these, the disciplines of medicine, physics, cosmology, and meteorology. He discovered atmospheric orgone and noticed that, in the presence of pollutants of various kinds, including electromagnetic emissions, the orgone would become stagnant and cause illness and environmental damage. Dr. Reich called this "stagnant" orgone, "dead" orgone or "DOR". The effects of DOR would often be that of drought and the formation of deserts. In one experiment starting in October, 1954, Dr. Reich was successful in bringing rain to the desert around Tucson, Arizona. Even before the rain fell, the newly-balanced orgone had caused the grass to grow a foot tall in the desert. This green spectacle stretched some 40 to 80 miles to the east and north of that city. It took tremendous skill to use the cloud buster because it drew the dead orgone into the device and could pose serious health problems to both the operator and the atmosphere itself. The ability to safely use the cloud buster died with Dr. Reich and remained buried for half a century. Science, good or bad, historically moves forward of its own inertia; a scientist dies, another scientist picks up his notes and continues where he left off. Not so with orgonomy. It wasn't until almost 50 years after the (politically motivated) scientific community sentenced Dr. Reich to death and erased the memory of his work from history that a new and improved cloud buster would be developed. Self-taught bioelectric innovator Don Croft has recently developed a modern cloud buster he claims is safe for both the operator and the environment. Dr. Reich touched upon many aspects of the cosmic orgone energy and knew that it would take many people to develop the many potentials of its nature. In 1948 a close friend of Dr. Reich, by the name of A.S. Neill, stopped by Reich's laboratory, called Orgonon, in the state of Maine. He saw a small motor turning over that was attached to an orgone accumulator. "The power of the future!" When later asked if he had developed that power source any further, Reich is reported to have said that his job was one of discovery and he was going to leave it to others to carry out the results. The Idaho Observer understands the controversial nature of orgone energy. Though one cannot see or smell it, sensitive equipment can measure it. Therefore, it exists—regardless that the FDA determined [actually just pronounced, like a decree] it did not exist in 1954. Our contemporary controversy, therefore, has nothing to do with whether or not orgone energy exists, because the federal government's non-scientific wishing-it-away doesn't make it so. The controversy is the modern adaptations of orgonomy and claims by a growing circle of people who believe that Reich's work provided a foundation for positive changes in our embattled world. One has to wonder if those who worship the "DOR" and revel in its ability to cause misery recognized Reich's discoveries as a direct threat to their globalist intentions. Is that recognition the power behind the campaign to ruin the man and erase the memory of his orgonomic research from history? The answer becomes obvious when you place into perspective what the government did to Reich. It killed him at the age of 60 for continuing to research, without FDA approval, something it claims does not exist. When asked to prove orgone energy does not exist, it refused to provide the science that supports its claims or the identity of those who conducted the experiments and reached that conclusion. Those who have ever taken a high school-level biology class understand the scientific method and can determine that Dr. Reich was sent to his death by a government that ignored science to make a political point for all those who may wish to explore orgone energy: Do not. Most Idaho Observer readers understand energy—that good energy which produces good things (like sunshine, positive thoughts, healthy food, and healthy bodies) occupies higher vibrational frequency ranges, and bad energy that produces bad things (like rot, disease, unhealthy food, and negative thoughts) occupy lower vibrational frequency ranges. It follows, therefore, that a world saturated in low-frequency vibrations will produce a world filled with anger, hostility, disease, and death. What kind of world do we live in now? Because the U.S. government has managed to keep low, through a variety of socio/political maneuvers, the vibrational frequencies within which Americans operate, our people are sick, angry, frightened, and living in chaos—the environment most conducive to totalitarian control. Dr. Reich's work evoked the wrath of the baby totalitarian state. It killed him to send a message to scientists that orgone energy is off limits for further study. In the absence of scientists developing beneficial applications for orgone energy, the totalitarian state has come of age. Now it appears we have nothing left to lose. The pretense of freedom is gone. All that remains is the illusion of freedom being kept alive in the minds of dwindling numbers of Americans. As the totalitarian police-state emerges, its emissions of dead, stagnant energy from exponentially-increasing sources (both organic and inorganic) is also increasing. Rising to the challenge are groups of people who have picked up Dr. Reich's work and are running with it. Next month we will continue this story [in the Idaho Observer newspaper] with the adventures of those who claim to be using orgone energy to replace bad energy with good. A small candle, when lit, can, all by itself, overcome darkness, where the same amount of darkness cannot similarly affect light. The same is true when it comes to good and bad energy. That's why bad energy must have outside help from government and its duplicitous minions to prevail. Those who have chosen to expand upon Reich's work believe they can prove to a candid, if not doubting world, that the following ills can be corrected by the proper application of techniques that harness orgone energy. They believe in their ability to prove how properly directed orgone energy will neutralize bad-energy emissions from cell towers, chemtrails, and angry people. They also believe they can reproduce Dr. Reich's experiments and bring rain to drought-ridden areas. Can they direct orgone energy to accomplish these things? My own personal skepticism has been extreme for many months. However, a few things have happened to cause my skepticism to waver and my hope begin to grow. Besides, we haven't much else to lose. Wouldn't it be marvelous if something as simple as overcoming bad energy with good is the antidote for all the evil which has so saturated our modern world? Isn't it also just like God to set things up to be so simple even His human children can do it? Whatever Happened To William Washington? As Dr. Reich indicated, he only discovered the shoreline of what could lead to a universe of potential applications for orgone energy. Though we may never know which potential application caused the federal government to sentence Dr. Reich to death and zealously seek out and destroy all references to his work, a clue may be found in the mysterious Fall of 1948 disappearance of William Washington. Reich biographer and Harvard graduate Myron Sharaf (Fury On Earth: A Biography Of Wilhelm Reich, 1983), claims to have met "Bill" at the University of Chicago when they were both freshmen in 1944. Sharaf explains that Bill began working with Dr. Reich in the summer of 1947 to help him with the mathematics of developing an orgone energy motor. "When he left Orgonon in Fall, 1948, he took the motor set-up with him in order to work on further refinements. He was supposed to return to Orgonon in early Summer, 1949, but he did not appear, nor was there any word from him" wrote Sharaf. Sharaf and Dr. Reich checked out some of the stories Bill had told them about his past and previous employment. "None of these stories proved true" Sharaf noted. Dr. Reich was able to speak to Bill on the phone once in late Summer, 1949. Reich, a lifelong student of the human mind, deduced that Bill was hesitant in his speech because he was being monitored by some outside force, probably the federal government, a conclusion not shared by Sharaf. "Washington was never heard from again" wrote Sharaf. Ola Raknes, Ph.D., had observed the orgone-force motor in action and saw that the theory was valid. Unfortunately, no further research into this area was conducted after Bill left Orgonon. "This would be an extremely important area of orgone energy research" Raknes observed in 1970. Dr. Wilhelm Reich was first a protégé and then a contemporary of Sigmund Freud. Most people associate Freud with his belief that the manifestations of being human are directly related to sexual repression or expression. As Dr. Reich's work began pulling away from that of Freud, he became intrigued with identifying the specific form of energy that made sexual expression possible. tension > charge > discharge > relaxation. Dr. Reich isolated the particle responsible for this formula and named it "bion". He was also able to culture bions from inorganic matter and, quite accidentally, solved the riddle of biogenesis: He discovered the mechanism whereby lifeless substances transition to living matter. Organic substances attract and absorb orgone energy. Metalic substances attract and repel or reflect orgone energy. Stopage of orgone energy by any metalic obstacle, as well as by a sensitive living organism, will result in a rise in temperature. We should begin construction of the Museum of Federally-Buried Technologies so we can dream about what the world would be like if problem-solving intelligence was celebrated instead of persecuted. Did the FDA ban evil's antidote in 1957? Dr. Wilhelm Reich, MD, died at the age of 60 after serving eight months of a two year prison sentence. Since his death, tremendous energy has been expended to erase his memory from history. "The existence of such energy is still contested—or at least neglected—by practically all scientists who have not themselves made the observations and experiments, and had the experiences, that form the basis of the discovery. An American Federal Court has even, in March, 1954, in a Decree of Injunction, declared Orgone Energy to be nonexistent, without, however, giving the facts on which the Injunction is said to be based. In a correspondence with the present writer [Raknes] the Food and Drug Administration (FDA), on whose complaint the Injunction was decreed, said that experiments executed with the most modern equipment and methods by experienced scientists had proved the nonexistence of orgone energy. None of these experiments has ever been published, and in further correspondence, the FDA refused to divulge the names of those scientists or any of the experiments on which the complaint was said to be based. As Dr. Reich did not obey the injunction, he was arraigned for contempt of court and sentenced to two years in the penitentiary. He died in prison after not quite eight months." Dr. Reich, a world-renowned psychologist and protégé/contemporary of Sigmund Freud, was sent to prison at age 60 to die because he insisted upon continuing his research into orgone energy—in defiance of a federal injunction that resulted from the FDA's apparently unscientific opinion that orgone energy did not exist. All Reich's books were banned, and those that were found were burned by the FDA. Any printed matter that contained the word "orgone" was subject to the ban and burning by the FDA per the injunction. The injunction was still holding in 1970. The question now becomes: "What is orgone energy?" If it did not exist, why did the federal government behave so militantly in its attempts to remove all mention of it from the world of print and the minds of people? Why did the federal government give a death sentence to a well-respected old man for insisting upon continuing his studies of something that doesn't even exist? The federal government has used its authority to ban many viable and useful technologies. Should we accept the FDA's position that orgone energy doesn't even exist? Or, is it in our best interests to take another look at Dr. Reich's work and his controversial theory of life energy? More importantly, can orgone energy be used to help neutralize the negative energies that so permeate our modern world?